I decided to compile a list of responsibilities that an usher holds when standing in a bridal party. If any of you have want to add to this list please feel free. 1) Help the groom and Best Man with any wedding errands, from booking the limos to making follow-up calls to assure all is in order. 2) Help the Best Man throw the Bachelor Party or dinner, whatever may be the case. 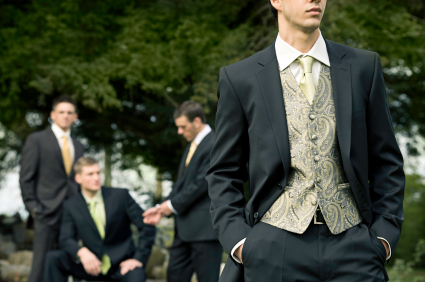 3) Pay for the rental of the tuxedo for the wedding day. 4) Be able to attend the rehearsal and rehearsal dinner. 5) Decorate the “wedding car” if there is one to decorate. 6) Seat the wedding guests as they arrive to the ceremony. Make sure to go over the seating plan with the bride and groom so they are content with the outcome. Pass out any ceremony programs to the guests as they arrive. 7) Provide transportation for the bridesmaids, if needed, from the ceremony to the photo location and then to the reception hall. 8) Be able to provide directions to the wedding guests, whether it be advising close family of the location family photos will be taken, or letting wedding guests know when the reception opens. 9) Finally….dance with the bridesmaids at the reception, if it is decided to have “a wedding party dance”.